Flip-flops, breezes and long conversations. My evening was full of this. It feels like we are on the verge of a wonderfully large thunderstorm, the air is thick and the light muted. I was relieved to reach my little hill-side retreat and sit with the birds for a few minutes. As I absently massaged my tired, sad feet, I thought of the two pair of flip-flops I had dug out of storage in the tackroom armoire earlier today. Old flip-flops are a foot’s best friend. They are molded and light, perfectly balanced to the wearer’s habits. Mine are always slightly run down on the inside of the left foot. Hanni called and I am so warmed by our daily conversations as she makes a giant move in her life. After six years, at twenty-four years young, she is stepping away from what she has called home and venturing forth, again. We all do this as we travel through the ages and stages. Her sister recently made a similar seismic shift. I won’t lie, it looks easier to me when I look back from almost sixty years old. There is a soft, rhythmic slough-slough sound that old flip-flops make when I pace through house and our phone conversation. It is reassuring, a sound that has followed me through so many years and miles of living. The wind has kicked up the chimes and a soft rain has arrived without any fanfare… It grows to a steady beat and there is a low rumble across the valley. Water begins to course down the roof and eaves, loudly protesting its dash on the decks. I am reminded something I wrote thirty-seven years ago in Southern Illinois as I sat and contemplated what life should look like at twenty-three. And now the rain. Blinding, soaking instantaneously. Spotting, puddling, rushing. Locusts scream between deafening cracks and flashes of bright white light that blind. A solid wall of glass-like water. Cracked dusty earth sends up smoke signals before surrendering to the foamy floods. The heat is gone, replaced by tension-packed torrents. The roof leaks, the curtains drag at the damp windows. The old house sighs in silent relief. More gently now, trees sway carrying heavy, wet leaves. The locust and birds are silent. The thunder is softer now, gently rolling on south. Gushing rivers slow to bubbling puddles. Sirens follow the thunder, chasing it out of town. The trees have stopped. They droop like my drenched, hairy dog. People sounds return; cars sloshing by. The first startled bird cries out. The lightening has ceased to amaze. This entry was posted in memoir. Tagged aging, finding oneself, life after 55, memoir, New Hampshire, Parenting 20 year olds. I love an old pair of flip-flops. 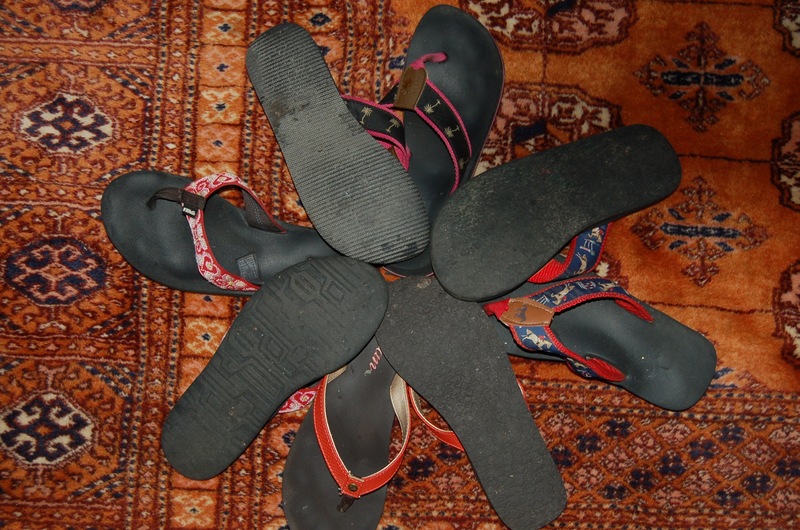 So comfortable and happily donned when the perfectly worn in slippers are put away for the summer. Like comfort food, they just feel good. There’s nothing like a thunderstorm to clear the air or comfortable shoes. As a walker, Marie, you certainly can appreciate the comfort of a good pair of shoes. I do love a thunderstorm! !